Observations by NASA's Hubble Space Telescope indicate that the upper atmosphere of the "hot Jupiter" exoplanet HAT-P-38b is free of clouds or hazes, whereas most of the atmosphere of WASP-67b — a similar planet in many ways — is masked by high-altitude clouds. The "hot Jupiter" exoplanets HAT-P-38b and WASP-67b are similar in many important ways. For example, the giant alien worlds are about the same size and temperature (1,300 degrees Fahrenheit, or 700 degrees Celsius). And they orbit their nearly identical host stars at the same distance, completing one lap every 4.5 Earth days. So it seems logical to assume that their atmospheres are pretty much the same as well. But that's not what astronomers found. 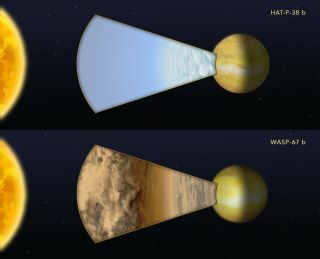 "One planet — WASP-67b — is cloudier than the other — HAT-P-38b," study leader Giovanni Bruno, of the Space Telescope Science Institute (STScI) in Baltimore, said in a statement. "We don't see what we're expecting, and we need to understand why we find this difference." Bruno and his colleagues used NASA's Hubble Space Telescope to study the two exoplanets, both of which are tidally locked (meaning they both always show the same face to their parent star, just as the moon always shows one face to Earth). These clouds, by the way, are probably made of sodium sulfide and potassium chloride, not water vapor like the clouds of Earth, the researchers said. The difference between the two gas giants may trace back to a divergent early history. This diagram compares Hubble Space Telescope observations of two similar "hot Jupiter" exoplanets orbiting very closely to different sun-like stars. HAT-P-38b has a water signature, indicating the upper atmosphere is free of clouds or hazes. By contrast, WASP-67b lacks any water-absorption feature, suggesting that most of the planet's atmosphere is masked by high-altitude clouds. "You can say it's nature versus nurture," co-investigator Kevin Stevenson, also of STScI, said in the same statement. "Right now, they appear to have the same physical properties," Stevenson added. "So, if their measured composition is defined by their current state, then it should be the same for both planets. But that's not the case. Instead, it looks like their formation histories could be playing an important role." Additional observations by Hubble and NASA's $8.9 billion James Webb Space Telescope, which is scheduled to launch in late 2018, could shed light on the exoplanets' pasts, the researchers said. Bruno presented the new results yesterday (June 5) at the 230th meeting of the American Astronomical Society in Austin, Texas.